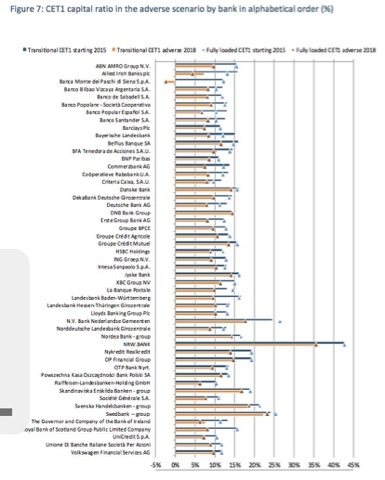 European Banking Authority (EBA) published today the results of the 2016 EU-wide stress test of 51 banks from 15 EU and EEA countries covering around 70% of banking assets in each jurisdiction and across the EU. The objective of the stress test is to provide supervisors, banks and other market participants with a common analytical framework to consistently compare and assess the resilience of large EU banks to adverse economic developments. Along with the results, the EBA is providing again substantial transparency of EU banks' balance sheets, with over 16,000 data points per bank, an essential step towards enhancing market discipline in the EU. The EU banking sector has significant shored up its capital base in recent years leading to a starting point capital position for the stress test sample of 13.2 % CET1 ratio at the end 2015. This is 200 bps higher than the sample in 2014 and 400 bps higher than in 2011. The hypothetical scenario leads to a stressed impact of 380 bps on the CET1 capital ratio, bringing it across the sample to 9.4% at the end of 2018. The CET1 fully loaded ratio falls from 12.6% to 9.2%, while the aggregate leverage ratio decreases from 5.2% to 4.2% in the adverse scenario. credit risk losses of €-349 bn contributing -370 bps to the impact on the CET1 capital ratio. market risk across all portfolios including CCR (€-98bn or -100bps). The impact is partially offset by pre provision income flows, although these too are subject to stress factors and constraints in the methodology. For instance net interest income falls 20% in the adverse scenario from 2015 levels. The 2016 EU-wide stress test does not contain a pass fail threshold. Instead it is designed to support ongoing supervisory efforts to maintain the process of repair of the EU banking sector. The stress test will therefore be an important input into the supervisory review process in 2016. As the stress test has a range of constraints designed to ensure comparability and consistency, supervisors will assess mitigating management actions before deciding on the appropriate supervisory action, of which a wide range may be employed. The focus in 2016 will, however, be on setting Pillar 2 Guidance to banks to maintain capital that can support the process of repair and lending into the real economy. Although pillar 2 Guidance is not a legal minimum, and does not impact the threshold for the Maximum Distributable Amount, banks are expected to follow guidance in normal circumstances. Acting as a central data hub for the entire EU, the EBA is publishing both aggregate results of the EU-wide exercise and granular data for each bank, including detailed information at both the starting and end point of the exercise, under the baseline and the adverse scenarios.